Molokini is a crescent shaped islet located in the ‘Alalākeiki Channel about 3 miles off Maui’s southwestern coast. Access is by boat only, and charter boats operate out of Lahaina, Mā‘alaea Harbor and Kīhei. Molokini islet is the southern rim of an extinct volcanic crater. The shallow inner cove is the crater’s submerged floor. Black coral was once found in abundance in the deeper waters around Molokini, but was harvested extensively. Harvesting is now restricted, and small colonies can be found on the islet’s back wall. The MLCD is divided into two subzones. 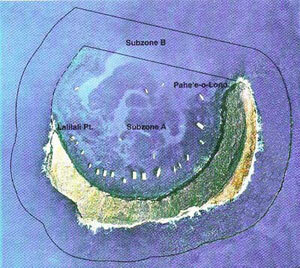 Subzone A includes the cove, bounded by a line extending from the end of the submerged ridge off Lalilali Point to Pahe‘e O Lono Point. Subzone B extends 100 yards seaward of the islet and Subzone A. There is no sand beach on Molokini. The cove area slopes off from the shoreline to a depth of about 100 feet before dropping off. The bottom consists of sand patches, coral and basaltic boulders. A shallow reef in less than thirty feet of water extends from the shoreline northward at the islet’s northwestern point. The diversity of fishes and other marine life within the MLCD is among the most impressive in the state. Even humpback whales have been known to enter the cove. The back (southern) side of the islet has a steep face that drops off to depths of over 200 feet. Small patches of coral are scattered across the wall. Crevices and outcroppings harbor large populations of fishes. Currents can always be a problem outside of the cove, and may get stronger inside during the afternoon when winds pick up. When diving the back wall be sure to keep an eye on your depth gauge. To fish for, take, or possess any finfish by trolling in Subzone B only. To engage in commercial activities, excluding the taking of marine life, with a permit. To fish for, take, or injure any marine life (including eggs), or possess in the water any device that may be used for the taking of marine life, except as indicated in “Permitted activities” above. To take or alter any sand, coral, or other geological feature or specimen, or possess in the water any device that may be used for the taking or altering of a geological feature or specimen. To feed or deliberately introduce any food material, substance, or attractant directly to or in the vicinity of any aquatic organism by any means or for any purpose except for trolling in Subzone B. To moor boats for commercial activities, except as provided for by a permit. To anchor boats when a day use mooring system is established by the Department. Note: Molokini is a state seabird sanctuary, and entry onto the islet is prohibited.